If you are in a hurry and just want to find out what the best canvas tent for camping is, We recommend the Trek Tents 246C Cotton Canvas Tent as the best all-around solution. There are so many different types of tents out there, so it can be challenging to decide which is right for you. If you are looking for the best canvas tent – that means you are looking for a tent that has efficient height, water resistance, and durability. Canvas tents are great for campers of all types from serious backpackers to family outings to the area campsite. Since you are interested in getting a canvas tent, we reviewed five of the best and broke everything down for you. Before we dive into all the different types of great tents that will make camping enjoyable and comfortable, we’re going to help you understand the in’s and outs of canvas tents. These kinds of tents are slightly different from nylon. They are typically stronger and better during extreme weather – but not all of them are. We’re going to look at a few ways for you to tell if your tent will hold up against the elements. If your tent is a canvas tent, it should contain as much percentage of cotton as possible because that is what canvas is made of. A lot of manufacturers claim to have canvas tents, but the portion of cotton in the canvas tent material is so low that it rips and tears easily. Good canvas camping tents are high enough that you should have no issue standing up in them. The price of these tents is much more significant, and so is the weight so for that you should have a tent that is large and able to fit a right amount of people. Is Canvas Better for Cold Weather Camping? While warm weather camping is typically the focus of reviews and articles, cold weather camping provides a nice change for those who are serious enthusiasts. When it comes to camping in the snow, canvas tents always perform better than nylon and polyester. Canvas tents are much more durable which allows them to deal with the harsh conditions of winter such as higher winds and heavy snow. Due to the cotton structure of canvas tents, this also makes them much better insulated than their counterparts. If you bring heat into a canvas tent and do not let it escape it will stay with you for a while. One cool thing is that a lot of canvas tents come with a chimney hole, so you can build a fire inside the tent to guarantee you stay warm. They are similar to how a teepee would work. 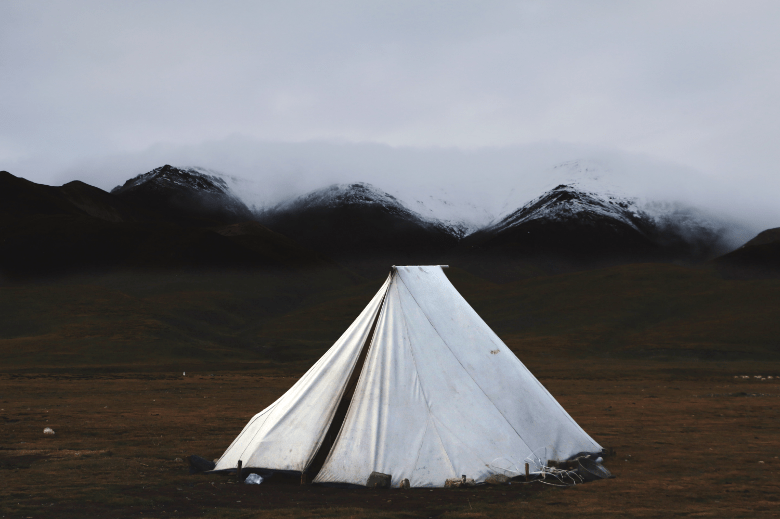 In addition to size and durability, there are also a lot of other features to look out for when buying a canvas tent. Be sure you get the most out of it by including these specifications in your searches. Some of the best canvas tents come with multiple rooms. These walls are usually able to be put down and then retracted when you do not want them. This makes the tent incredibly versatile because you can camp with your family and possibly separate the rooms, or you could camp with your buddies and leave everything open. One of my favorite things about canvas tents is their overall versatility and ability to work in a bunch of different situations. Like I mentioned previously, you can often keep a fire inside your canvas tent if you have the right equipment. If you plan on camping during cold months, this is the definition of luxury. There are few things better than waking up to a sunrise, surrounding by snow and still hearing the crackling of the fire while you lay in your underwear inside the warm tent. Just ensure you have the right stove jack that is entirely fire resistant and that everything is set up correctly, so you are expelling all smoke from the tent. One of the significant disadvantages of canvas tents is their weight. That is a tradeoff you get for durability and design. Due to the heavy weight of canvas tents, they cannot rely on aluminum stakes to hold them up. This requires canvas tents to have bulkier and more complicated frame setups so if you are someone who does not have the patience when setting up a tent you may want to look into getting a simple set up. This also makes emergency set up almost impossible if you have not done it a bunch of times. But, again this a trade-off you get for a durable and luxurious tent. This six-person tent is the king of durability because it is sturdy and robust. The primary purpose of this one’s for camping and hunting, but it can be used for family outings and other adventures as well. The fabric of this tent gets made with military grade canvas, and the tent itself gets suspended over a powder coated frame. There is an awning in the front that provides some additional coverage as well outside the tent. This tent is made of 100% cotton duck canvas and is highly durable and water resistant. Inside the tent, it features a 6’6” ceiling, so you do not have to worry about standing up inside this tent. One highly functional feature of this tent is the double D doors on the front and back. This is a pretty unique feature, but it’s nice to have easy access inside and outside the tent. One of the most significant issues people deal with when it comes to canvas tents is the internal heat of the tent. With this one there are two vents to help circulate fresh air in and push the hot air out. This is an excellent feature. As for space – the manufacturer claims that the tent can fit up to eight people, but we do not agree. The length of it is 14 feet which are about 4 feet too small. You would struggle and most likely be uncomfortable trying to squeeze eight people into this tent. This is a tent for people looking to store items for an extended period or serious camping trips. The walls and ceiling are 100% cotton, and the floor is a vinyl canvas that wears very slowly. One of the main features that I like most about this tent beside the overall size is the fact that it comes with such large doors and windows. In addition to camping and hiking, you could use this tent in your yard for parties as well. The tent is 14’ x 10’ with a 96” ceiling, so you do not have to be concerned with bumping your head in this tent. The manufacturer says this tent can fit nine people and I don’t entirely agree with this one either. The ceiling height may be higher but the size is the same as the previous tent, and I do not believe it is large enough for nine people. If everyone in the tent was 5’1” then maybe you could, but I would not recommend trying to squeeze nine people into this tent if you are going on a trip. Have a backup plan in case you do not all fit comfortably. This unique tent measures in at almost seven feet in length but is only three feet wide. The tent itself comes with a foam mattress and zips open at the head and feet for airflow and temperature control. This tent is intended for someone who is looking for a light tent for backpacking alone. The tent gets the job done because it keeps the bugs away from you when you are trying to sleep, and it keeps the rain and moisture out when you need it to. If you are looking for an affordable and straightforward tent that is easy to travel with this is the right choice for you. From the outside looking in this tent looks like it has it all, but is it that different from any other canvas tent. Not really. The overall width of the tent is 16.4,’ and it comes with a canvas to cover the roof. The canvas also comes with a chimney hole which is pretty cool if you are looking to build a fire inside the tent on cold nights. One of the coolest features of this tent is the ability to roll up all the sides of the tent to allow cool air to pass in each direction. This allows you to keep the tent cool during the hot days and close everything up when it starts to chill out. The tent is waterproof, and the manufacturer recommends not using the tent in winds higher than 30 miles per hour, but it definitely can withstand quite a bit of abuse. The Trek Tents 246C Cotton Canvas Tent gives you everything you need and more. In comparison to some of the others, this tent is 100% cotton, it comes with a very high ceiling, and it has a durable flooring design that allows you to walk comfortably on all kinds of terrain. If you are looking for a luxury tent that has durability and appeal, Trek Tents are the way to go.